Many investors look at two or three properties in their local area and then purchase one. And they’re probably going to pay more than what it’s actually worth. Looking at multiple investment properties in multiple areas means you can get a better understanding of what properties are actually worth and you can ensure that you buy a property that is going to move you towards your financial goals. Many famous and very successful property investors use the “100/10/3/1 Rule”. The general idea of this rule is: you look at 100 properties and make offers on 10. Of those ten offers perhaps only 3 will be accepted. And of those three that are accepted you’ll purchase 1 property. One hundred sounds like a lot of properties. But the internet makes it much easier to look at and analyse properties than it used to be in the past. So make sure you’re looking at a lot of properties before you go ahead and buy. Start by seeing the locations of these 10 positive cash flow properties. Tip number two is to research the area. Just because you live in an area doesn’t mean you know what the property market is like and how it’s going to perform in the future. And it’s even more important to do your research if you’re buying out of area. It’s so important to understand how the area is going to perform in rental returns and in capital growth so you know that you’re buying a solid investment. I recommend a tool called “Ripe House” – They have a free trial that allows you to look at all aspects of an area like the hot-spots and the blue-chip properties and the government housing. I also suggest that you do more research by comparing other previously sold properties in the area. I have a full module dedicated to how to research an area inside On Property Plus. So you can check that out and become an expert in researching. Just because a real estate agent says that there’s another offer on the table doesn’t necessarily mean that there is another offer on the table. Just because a real estate agent says that this is a great investment property doesn’t mean that it’s going to be a great investment property for you. Always do your own research and possibly get outsider opinions on the property. It’s a good idea to go to another real estate manager and request a valuation on the rental income for the property. That way you’re getting a party to evaluate it who is not going to get a commission on the sale of that property. 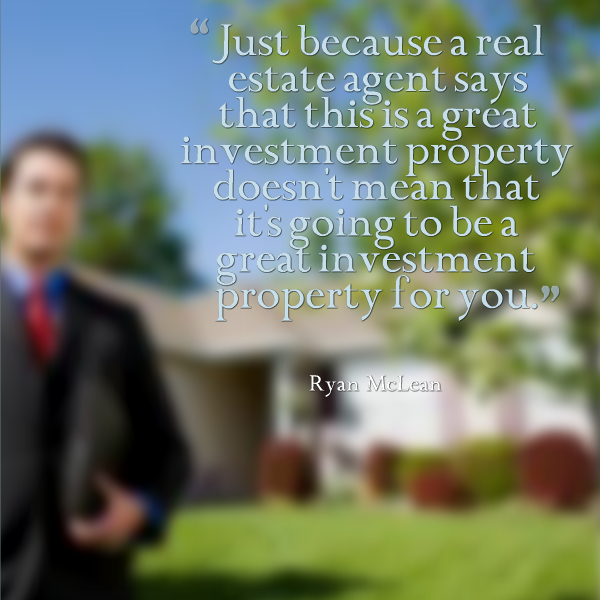 So don’t always believe what the real estate agents say. They are very helpful but sometimes they can stretch the truth just a little bit. Consider whether conveyancers or solicitors are better for your situation. I suggest you look into both. A more complex transaction will probably be better suited to a solicitor. A very simple transaction could be handled by a conveyancer. They would be cheaper than a solicitor and may be able to do the same job. The main difference between conveyancers and solicitors is that conveyancers may be restricted in what they can do if things get complicated. So look at the differences between them because you could save yourself a couple of grand going with a conveyancer instead of a solicitor. Tip number five is to get a building and pest inspection done. It amazes me how many new investors purchase a property without any building or pest inspections only to find out that it’s termite-ridden or that it has issues with the foundations. Paying for a building or pest inspection means that you can be assured that the property is up to standard and doesn’t have any major issues that are going to cost you an arm and a leg down the track. Tip number six is not to get emotional. Most of us will get emotional when we purchase our first investment property. But getting emotional means we could pay more for the property than we should have. We can easily make poor financial decisions if we think emotionally and don’t stay objective about the potential investment. When it’s your home there’s obviously some emotion involved there. But look at buying your first investment property as a financial deal – as if you’re buying stocks on the stock market. Try and take your emotions out of it and assess it for what it is. This is a mistake that many people make. They go out and purchase property without setting financial goals first. They don’t know what properties are going to help them achieve their financial goals because they don’t have any. It’s not going to make a whole lot of sense for you to go out and purchase a negatively geared property if you want passive income. And it might not necessarily be good to purchase in a rural area if you want fast capital growth. You can put yourself in a much better position to achieve financial success if you set financial goals and understand exactly what you want to achieve. You can then purchase properties that line up with your goals. Remember that investing in property is a vehicle for financial success. It’s a means to an end. It’s not the end itself. You want to achieve something financially. So know what you want to achieve and try and buy property that will help you to achieve that. Ask them about the street and the neighbourhood and if there’s anything that you need to know. Sometimes talking to the neighbours is less about what the neighbours actually say and more about who the neighbours are. You can find out a lot about an area by understanding what kind of people live there. Go to the local coffee shop and talk to people who come in. Find out as much about the area from the locals as you can. It’s easy to get excited when we buy our first investment property. We want to go out and purchase it as quickly as we can. But hold your horses. The property market is not going anywhere. There’s always going to be properties for sale. There’s always going to be great investment deals somewhere in Australia. Don’t be in such a rush to purchase an investment property that you pay too much for a property or buy the wrong property that isn’t going to deliver the financial returns that you want. Wait until you find the right property and then consider investing. Tip number ten is to do the cash flow analysis. This is something that’s not that easy to do but it is so important. Don’t just assume that because your mortgage is $400 per week and the property rents for $450 per week that your property is going to be positively cash flowed. It probably won’t be. You need to analyse all of the expenses of the property and all of the income. There are a lot of expenses associated with investment property that you need to consider before you invest. This includes everything from council rates to property management fees to insurances and many others things. You need to understand exactly what they are and when they’re coming so you can predict it and prepare your finances for it. The last thing you want is to purchase a property thinking it’s going to be positively cash flowed and – because you didn’t do the analysis properly – find that it’s actually costing you hundreds of dollars per week that you cannot afford. Almost everything in property is negotiable. But most people go in and they negotiate on price alone. They don’t consider negotiating on the terms of the arrangement. You can negotiate things like settlement dates. You can delay settlement dates or move them forward. You can have early access to the property. You can put down a smaller deposit. There are a bunch of things that you can do that can actually make the deal more beneficial to you but can also make the seller feel like they got the price that they want. This can be difficult for new investors to understand but think about it. You’re holding your deposit of $100,000 for an extra month and you’re getting 6% on that. That means you’re going to earn 0.5% on that $100,000 – $500 in one month. So delaying the property for one month will actually be worth $500 for you. And that’s just a very rough and very simple example. 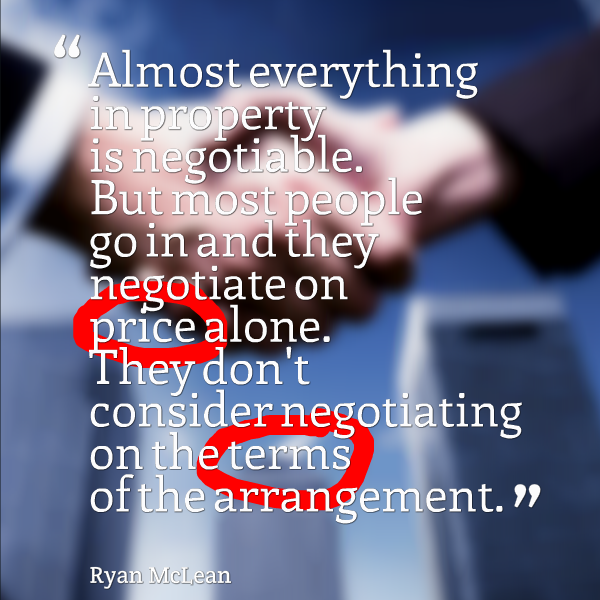 But there are ways that you can negotiate a better deal without negotiating on price. You may want to negotiate both on price and on the terms if you can. But do consider the terms and see if you can create a better deal for yourself. 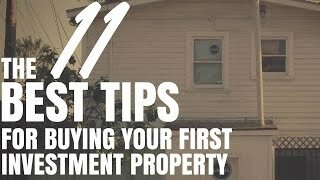 There you have my eleven tips for buying your first investment property.